In this research we investigate an emerging class of oscillators known as spin-torque oscillators (STOs). 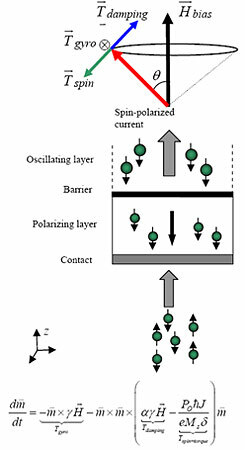 Similar to YIG oscillators, the oscillating mechanism is a gyromagnetic procession of magnetic moment in a DC bias field. Differing from the traditional YIG, STOs are not driven by an external RF field, but rather by the torque generated by a spin-polarized current – yielding a device that is driven by a DC current. Recent device designs by collaborator Prof. Jimmy Zhu (CMU) have shown that the required bias field can be made current dependant, allowing tenability in oscillating frequency. Due to the high Q of magnetic materials (Q ~100) and the wide tuning range (1-2 decades), these emerging oscillators are very attractive for agile radio systems, i.e. software defined radio and cognitive radio. The main focus of Prof. Ricketts research in this area is device design and optimization for low phase noise and integration/application with CMOS integrated circuits.